Tablets are a great way to stay connected in the technological world that we live in today. They can be used for gaming, connecting with friends and family online, reading a good book, or even watching a good movie or television series. There are a lot of things you need to consider when purchasing a new tablet, starting with the brand that you prefer to purchase. 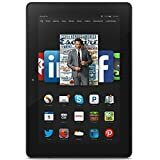 This guide is designed to take an in depth look at Amazon Kindle Fire options, and help you find a device that is perfect for you. We will take size, memory, compatibility, and resolution into consideration as well as give you four picks that are reliable options to select from. We have also included a budget friendly option for those of you who are ballin’ on a budget. 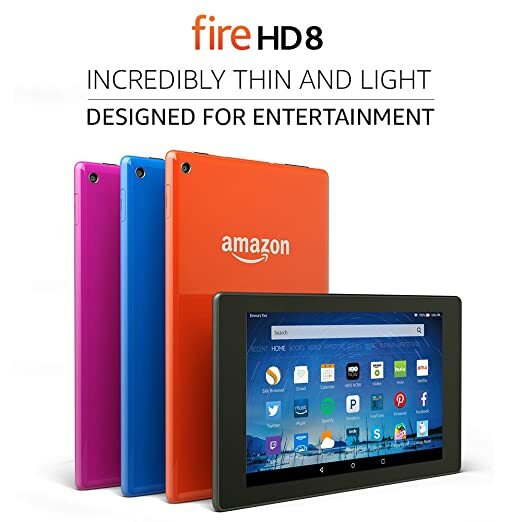 Our gold pick when it comes to Kindle Fires is the Fire HD eight inch tablet. It is a device that is only 8.4 inches long, five inches wide, and 0.3 inches high. It is an extremely lightweight option that is about 11 ounces, so it is easy to carry around in your backpack or purse. The device is designed with a metal frame that is then covered by a plastic exterior. This makes the unit a durable option that will not be damaged easily. The exterior of the plastic is finished with an ultra glossy coat that makes the device look sleek and stylish. The only downfall to this glossy finish is that you will easily be able to see fingerprints. This tablet can be purchased with a black, blue, magenta, or tangerine shell. The Fire HD is designed as an eight inch tablet that has a wide screen aspect ratio of 16:10. It has a resolution of 1280 x 800, which is a standard resolution for many of the tablets in this price range. You will see that the images are displayed at 189 pixels per inch, which can give you a crisp image, but it is a bit low for a high definition device. The device features an IPS LCD screen that is complete with a slimline architecture, which means that the image being displayed on the screen will be viewable from a wide viewing angle. You will not be required to look at the display from directly in front of it. The color will be vivid from all angles, and the image will pop out at you from the surface of the screen instead of being recessed in the back of the screen. The screen is also comprised of gorilla glass, which is meant to protect the screen from unwanted damage. In addition, there are two Dolby Atmos speakers located on the bottom of the unit to give you a great sound experience to match the visual display. Insofar as the performance of this tablet, you can see that it was designed with viewing media in mind. It features a quad core Media Tek processor that is designed split the power that each core requires. Two of the cores are 1.5 gigahertz, while the other two are only 1.2. All four of the processors combined will give you a device that can run efficiently without causing any lag or slowdown in the graphics. This unit only has one gigabyte of RAM, but it is still able perform well in most gaming situations. This tablet comes with eight gigabytes of storage, but you can decide to select the 16 gigabyte option or simply expand the internal storage by inserting a SD card into the SD card slot. In addition, the battery of this tablet is designed to last eight hours, but the amount of time you actually get out of the device before it needs to be recharged will depend on the way it is being used. For example, a game will most likely use more power than simply surfing the web. The Fire HD comes complete with Fire OS5, which is an operating system that has the skin of an android system, but it differs greatly in design and functionality. The interface is separated into several different categories where you can store your information and applications. The categories are drawn from Amazon Prime features that you may utilize. They are recent, home, books, videos, games, shop, app. music, audio books, and newstand. 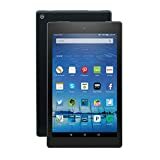 Since this tablet is centered around Amazon Prime and all of the features included with the service, Amazon has decided to include a free month of the service with your purchase of the Fire HD. Members will also receive unlimited cloud storage usage to give you unlimited space options. Other software that is designed to make your Kindle experience better is the Word Runner feature, which is designed to help you read at a faster rate of time. This feature allows you to look at the center of the screen as you are reading and the device will scroll the words to where you are looking. It will monitor the rate at which you read and accommodate when needed. You can also press the screen to slow it down if you need. There is also a Blue Shade mode that is designed to give you better light to read in at night. Another feature that you may be interested in is the camera. This tablet has a five megapixel camera for capturing images around you as well as a front facing camera to take selfies. This tablet comes with the Amazon Activity Center, which is a way that parents can control what your kids watch on the tablets as well as the time that they have access to the applications that are on it. You will also be able to put settings in place that will only allow them to play games during certain hours of the day if you want to make sure that their school work comes first. There is also a feature that is called Family Library, which allows you to link your Amazon account across devices. This means that you will be able to share the books you’ve read with your children if you wish to do so, watch the same movie on multiple devices, or share music that you enjoy, and the best part about this feature is that you can share across iOS and other Android devices as well. In addition, when you purchase a Fire HD tablet, you will receive a one year warranty, which can be extended to a period of up to three years if you desire. Our Silver pick is another quality Kindle Fire tablet, as you should expect, but this time it is a seven inch tablet. It is a bit heavier than our gold pick, weighting in at about 13.9 ounces, but it is still very easy to place inside of a bag that you are carrying. It is 7.6 inches long, 5.4 inches wide, and 0.4 inches thick. The corners of this unit are rounder to give it a more defined form, and the back of the device is tapered a bit to give you a better place to grip the device when you are holding it. The outer shell material is made from a matte plastic, but there is a shiny strip that can be seen near where the speakers are located. In addition, the power button is recessed on this model, which differs from some of the previous ones. This tablet can be purchased in a few different color options, which are blue, tangerine, magenta, and black. The screen of this device is a seven inch IPS LCD display that is capable of giving you a great viewing experience. It has a resolution of 1024 x 600, which is a standard level for a tablet at this price range. It has 171 pixels per inch in the display, which means it will be clear, but not astonishingly so, as this is not a high definition option. The display will; however, offer great colors and exceptional viewing angles that are glare free. There are two speakers that are located at the base of this tablet that are designed to give you crystal clear audio as you watch your favorite movie. Performance-wise, this Fire tablet is designed to be able to handle most processes. It comes with a 1.3 gigahertz quad core processor that is designed to split the work load of the processor and share it amongst the four cores. This means that the tablet will be more effective when it comes to switching between applications and screens in a game. This device comes with 16 gigabytes of space, but if that is not sufficient, you can add a SD card to give you more. This option allows you to expand the storage to 128 gigabytes if you desire. The battery life of this tablet is able to maintain a charge for at least seven hours, but the actual time will vary depending on the applications that are active. As with our first pick, this Kindle Fire also utilizes a masked version of Android, which is the Fire OS5. It is difficult to recognize as Android simply because of the layout that is visible on the home screen. This UI focuses on Amazon applications and downloadable aspects as a priority over others. At first look, you will notice a horizontal list where you can see that your information is separated into categories, which are shop, games, apps, books, music, videos, newsstand, audio books, web, photos, docs, and offers. They are located on a rotating carousel that is easy to access whenever you need. Once you click one of the categories, then you will be taken to a virtual bookshelf that contains your information. With this operating system, you will also receive unlimited cloud storage to use. There is also a two megapixel rear facing camera as well as a high definition front facing one if you like to take pictures and crop them to share on social media site. When you purchase this tablet, you will find out that it includes features to enhance your reading, like Word Runner, which we already explained is a feature that brings the words to your eyes instead of you circumnavigating the page you are reading. You will also notice that this unit has Blue Shade technology, which tints the screen and makes it easier to read on a tablet without experiencing bright backlight. You will also have access to Family Library, an app that lets you share your media by linking your Amazon account on multiple devices. In addition, a free month of Amazon Prime; this gives you access to videos, movies, television series, music, and more. You will also receive a month of Kindle Unlimited, and a month of Kindle Magazine will be available to you for free. These features give you unlimited reading material that you may enjoy discovering. This device is also a kid friendly option that has parental controls available for your convenience. In addition, if you purchase the kids version of this tablet, then you will receive a year free of Amazon FreeTime Unlimited, a two year worry proof promise to replace the tablet if it is damaged, and a kid proof case that is designed to prevent damage from occurring. The standard model of this tablet comes with a 90 day warranty, but if you feel that you need more coverage, then you can extend it to one year, two years, or three years, which ever you prefer. 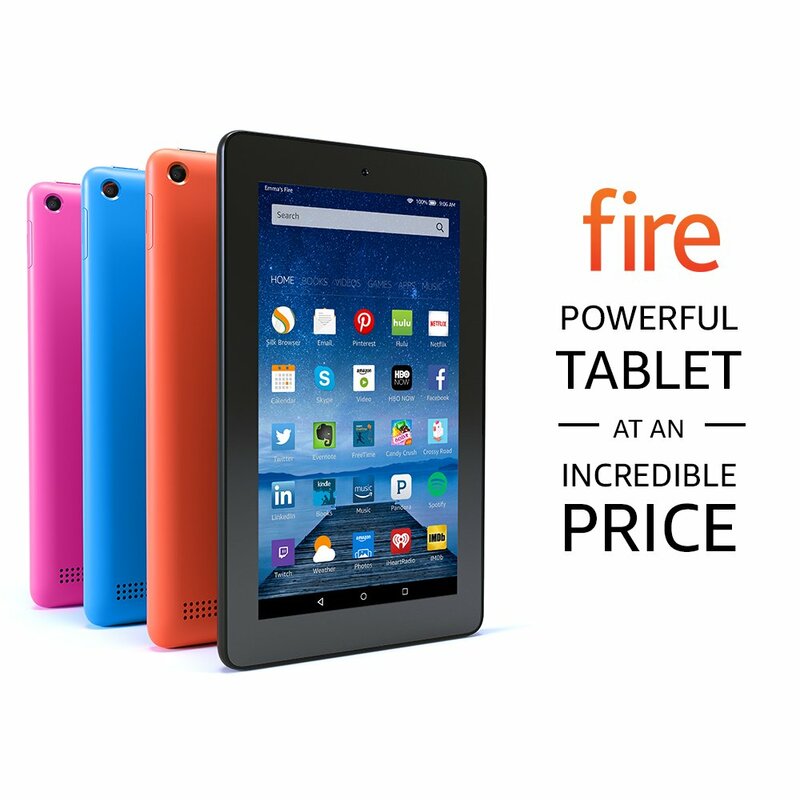 The Fire HDX, which is our bronze pick, is another great Kindle Fire tablet from Amazon. It is designed to be aesthetically appealing with a black magnesium finish. The front features a bezel surface that is attractive to the eye, and the back has a glossy finish, which may attract some unwanted fingerprints. The buttons on the device are concave, which gives it an even sleeker look. This lightweight tablet, which only weighs about 13.2 ounces, is one of the most powerful tablets on the market. This tablet features an 8.9 inch IPS LCD display that is great for any application. It has a resolution of 2560 x 1600 as well as a pixel per inch count of 331, which means that this device will provide you with extremely sharp images that will be displayed with almost perfect color accuracy. To further enhance the display, this tablet features dynamic lighting control. This is designed to adjust the tone and the coloration of the screen to accommodate the current lighting situation. It does; however, still have a hard time adjusting to the glare you can experience outdoors. In addition to an excellent display, the sound on this tablet is phenomenal, especially when you use headphones to listen to the audio. Two Dolby Atmos speakers are featured in this device to give you a fully immersive experience. The Fire HDX is a powerful device. It comes with a 2.5 gigahertz Snapdragon 805 processor, which is great for almost all gaming applications. In addition to the processor, it also includes an Adreno 430 GPU to improve your gaming power even more. This device has two gigabytes of Ram to ensure that slowdown does not occur, and it also has 64 gigabytes of internal storage. You will also have access to unlimited cloud storage; in case your internal storage is getting low. Insofar as the camera on this unit, it is one of the best that you will see on a tablet. The main rear facing camera is eight megapixels. It can shoot video in 1080p high definition, and it even comes with a LED flash, which is extremely rare for a tablet. There is also a front facing camera that captures images in 720p HD. The battery of this tablet lasts the longest of any device on our list. If you are using apps that take a lot of power, you can expect the battery to last about 12 hours before it needs to be recharged. If you are only reading, it can last up to 18 hours on a single charge, which is about double the battery life of the other tablets on this list. As we know, most Kindle Fire devices utilize a skinned version of an Android operating system, and this one is no different. The Fire HDX comes complete with Fire OS4, which is Android 4.4.3 re-skinned and repurposed. The main navigation menu that gives you access to your applications and programs is designed to be simple and easy to maneuver through. This device comes complete with Family Library, which allows you to share movies, music, and books across platforms with family members who have linked to you Amazon account. It also comes with Firefly, which is a feature that allows you to simply scan an item to get more information about it. You use the rear facing camera to scan from over 240,000 items that are related to movies, television episodes, and songs. Some of the other features that this tablet comes with include parental control options that can limit screen usage. A 30 day trial of Amazon Prime and Kindle Unlimited, which gives you access to a myriad of books, movies, and television shows. You will also have access to read to me, which is a feature that turns items written in text into something that you can hear. An origami case is also included with the purchase of this tablet, which is designed to give you the perfect angle for viewing movies. It can be folded in a way that will give you a great angle with both a landscape and a portrait point of view. If you are having technical issues with your tablet, Live Mayday support is available 24/7 to help you address the issue. A representative will co-pilot you through your tablet to find the issue and help you come to a solution. The Fire HDX also comes with a one year warranty to cover any issues, but if you feel that you need more coverage, you can purchase an extension that can last up to three additional years. Purchasing a tablet does not always mean that you have to spend hundreds of dollars to find a quality device. There are quality tablets available at a lower price point, now granted, they may not have all of the features of a top end tablet, but if you are using the tablet for casual purposes, then our ballin’ on a budget pick may be perfect for you. The Fire Tablet is a device that is designed to be compact and lightweight. It only weighs 11 ounces, and it can easily fit inside a small bag with dimensions that measure in at 7.5 inches long, 4.5 inches wide, and 0.4 inches thick. The device is available in four different colors, which are tangerine, magenta, blue, and black. The screen is a seven inch ISP LCD display that is designed to deliver crisp clear images. It has a resolution of 1024 x 600 and a pixel count of 171 per inch. This is a bit lower than many of the tablets on our list, but it will give you an image quality that features great color accuracy as well as the ability to view the screen at more obscure angles. When it comes to the sound of this tablet, there is only one speaker. It is also a rear facing speaker, so it tends to bring you a bit of a tinny sounding audio, but that can be adjusted easily by using headphones to listen to music or hear the dialogue in a movie. When it comes to performance, this tablet keeps up with the competition. It features a Media Tek 1.3 gigahertz quad core processor, which is designed to lighten the load that each core needs to carry and split the burden between the four of them. This Fire tablet comes with one gigabyte of RAM, which will work with the processor to prevent slow down in your tablet’s computing power. The device has eight gigabytes of storage space, but if that space is diminishing, you can always insert a SD card, which will allow you to expand the space to 128 gigabytes. In addition, you can also upload your information to the cloud, since you will receive free unlimited cloud storage with this tablet purchase. If you are interested in taking pictures or video chatting with your friends, then you will want to know about the two cameras that are present on the tablet. There is a front facing one for taking selfies as well as a rear facing two megapixel camera. A fully charged battery will least about seven hours, but the actual time will depend on the processes being utilized. When it comes to the operating system and the software included with this tablet, you should be aware that most Kindle Fire tablets use re-skinned versions of an Android operating system. This specific tablet uses Fire OS5, which is basically Android 5.1 with some changes that promote Amazon applications and products instead of using Google ones. In fact, the traditional Google Chrome search engine is replaced with Silk browser. The menu is designed as a horizontal carousel that can be cycled through to applications from specific categories, such as videos, music, and books, just to name a few. This device includes a special offers package that will show you an advertisement each time you come off of the screen saver. This will let you get insight into new apps, games, or books that may be of interest to you. There are also features that are designed to enhance your reading experience as well. For example Word Runner will help your eyes to focus on one area of the page that you are reading, which means that you will strain your eyes less. In addition, Blue Shade is a feature that is designed to help your eyes focus better in low light situations. As with many of the tablets already on this list, you will receive access to a free month of some Amazon services. These services include Amazon Prime, Kindle Unlimited, and Kindle Magazine. Through these three subscriptions, you will be able to have access to a myriad of reading materials, a plethora of movies and television shows, and thousands of songs from various artists. In addition, this device includes a feature that is called Whispersync, which means that you can start watching a show on your tablet, pause if, and then continue watching it on your television at a later time. This tablet comes with a limited 90 day warranty, but if you wish to have more coverage, you can always extend the protection for a period of up to three years. The screen size of the tablets available for purchase varies greatly. The size measurement of a tablet is the length of the screen diagonally, from corner to corner. You can find some as small as six inches, while others are as large as 14 inches. Most of the popular tablets are either about seven inches or ten inches. Maybe you personally prefer a tablet that has a large screen to enhance your movie viewing experience. Perhaps you would rather have a smaller seven or eight inch tablet that is closer to the size of a paperback book, which means that the device can easily be held in one hand while you are reading. Decide whether you want an alternative laptop option that is a bit larger, but easier to see, or if you would sooner own a smaller tablet that is more compact, lightweight, and convenient. As with size, the resolution of a tablet can vary greatly as well, but this is an important aspect to consider if you want a clear, crisp viewing experience. Most of the tablets available have a resolution somewhere between 800 x 480 to a much higher option of 2048 x 1536, which makes the range quite large. The higher the resolution is, the better the display will be. Most of the popular tablets available have a resolution close to 1280 x 800. Also, make sure to consider the pixels per inch that you will be able to see on the screen of the tablet you purchase, which will also help determine the crispness and the clarity of the display. In addition, the color accuracy and brightness may be a consideration you may wish to look into, especially if this device will be mainly used for movie viewing and gaming purposes. RAM is the tool that helps your tablet to perform better. It is effectively the memory on your tablet that works in combination with the processor to bring you a smooth connected performance. Most tablets have somewhere between one gigabyte of RAM and four gigabytes of RAM; in some cases you can even find a tablet with as much as 16 gigabytes of RAM. In addition to RAM, you will need to finds a tablet that has a good processor. The better processing power the device has, the better the overall functionality of the tablet will be. Make sure you take a look at both of these features to ensure that your new tablet will perform like you want it to. Tablets can run a series of operating systems that vary from Windows, iOS, and Android options, but since this article is based on Amazon’s Kindle Fire tablets, let’s stick to the operating system that is present in these specific tablets. Amazon utilizes an extremely customized version of Android. This operating system is called Fire OS, and it is designed to promote and make it easy to access Amazon features and services on your tablet. You can easily access the Amazon App Store, Amazon MP3, Amazon Video, and Audible, but you will not see things like the Google Play Store or Google Maps. In addition, it is important to know that some tablets are not able to be upgraded to the newest version of the installed operating system when it becomes live, so if staying current is imperative to you, make sure you can update your tablet’s operating system. A typical tablet has eight to 32 gigabytes of storage space. There are tablets that offer more internal storage; in fact, some have up to 128 gigabytes of internal storage space. This storage is where your game saves, your eBooks, the pictures you take, and the videos you watch on the tablet are stored. Some may feel that eight gigabytes is a limited amount of space, so make sure that the tablet you choose is capable of storing all of the information you want it to. If it does have a smaller storage size, then try to purchase a tablet that has a SD card slot that will allow you to add additional storage space to the device. The tablet you select will often vary based on the way you will be using it. If you are looking to watch high definition movies and play extremely detailed games on the tablet, then you will want to find one that performs well without slowdown in the processing speed and will have a good image quality that you can enjoy. If you are only using it for listening to your music, checking emails, and browsing Facebook, then you will not need as high of a performance level in your tablet. A tablet that is used for reading will typically be a smaller variety that can easily fit in one hand. If you are using this table for work purposes, then you may want to have a larger sized option that can easily be connected to a keyboard attachment. If you are purchasing a tablet for your kids to enjoy, then there are other considerations that need to be considered as well. For example, you will want to make sure that the tablet is on the smaller end of the spectrum, which will help ensure that their small hands can keep a grip on the device. Bumpers and padding may be a good choice for youngsters, but you may also want to make sure that the tablet has a kid’s friendly menu that they will be able to use. Parental controls are also great, especially if you do not want your child to be on a purchasing frenzy on the app store. Some companies, like Amazon, offer tablets that are designed especially for kids; in fact, these tablets even come with a warranty that will replace the device if your child does significant damage to the unit. Of course, since we are talking about Amazon tablets, the applications will all be found in the Amazon App Store, but did you know that there is an Amazon Underground App Store as well? It includes a large amount of Android applications, games, and purchase options that are free to obtain. 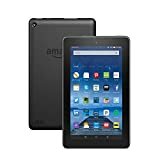 In addition, all Kindle Fire tablets come with a free month of Amazon Prime, which gives you complete access to all of the Amazon Prime features. This includes the video streaming service, the music streaming service, the eBooks that are available for download through Amazon, and even more perks like free two day shipping when you order items through Amazon’s website. The longevity of your tablet’s battery is extremely important. Make sure that your tablet keeps its charge for at least eight hours, if it dies more quickly, you may find yourself wishing it lasted longer on long road trips or periods of time where you may not be able to charge it easily. Some tablets can last for days without being charged, so the battery life on a tablet can vary by quite a bit. Another aspect that you may want to take into consideration is the price of the tablet you want to purchase as well as your personal budget. Tablets range from less than $100 to well over $1,000, but you do not necessarily need to purchase a tablet at the top end of that range if your budget does not allow it. There are plenty of great tablets available at a lower price range, just make sure that the tablet you are looking at has the features and the spec that you need it to have. Typically, the higher the price tag, the more processing power, screen space, and internal storage that you will see included with the tablet. • Protective Case – Tablets are electronic devices that you typically take with you no matter where you are going, so it only makes sense that you would want to have a case to protect the surface from being scratched or damaged. Most cases are designed to protect both the front and the back of the device; in fact, some case options have a strap that is designed to secure the area that covers the screen as well. Also, make sure that the case you select not only serves a purpose, but it expresses your personality as well. • Screen Protector – This is another accessory that you should purchase to protect your device. Even if your device is designed to be a durable tablet, the glass is still able to be scratched and broken. You can purchase screen protectors that are either plastic or glass, so decide how much protection your screen will need before making a decision on which one is best for you. • Stylus – If you play a lot of games or you use a lot of applications where a stylus could be useful, then you may want to consider getting one to use with your new tablet. If you like to draw or paint digitally on your tablet, then a stylus may be an indispensable tool that you will want available to you. • Attachable Keyboard – The other end of the spectrum from gaming and drawing is using the tablet that you purchase for work. Often times this will entail typing, checking emails, and corresponding though text based applications, which means that a keyboard that can be connected to your tablet may be a useful tool to have. As you can see, there are a plethora of different aspects to consider when purchasing a new tablet. We have looked at four different Kindle Fire models and considered the specs, features, and stylistic draws of each. We have also talked about some of the more important features that you should consider before purchasing a new tablet. Hopefully, this guide has helped you find a tablet that is perfect for your needs, but if you are still having difficulty deciding, do some due diligence to find a device that is right for you. 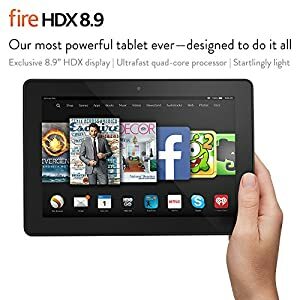 Don’t forget that if you cannot find the perfect Kindle Fire, there are other tablet brands available as well that you can consider.